Looking for some help, I've gotten most of the memory viewer with most items marked, only thing I can't find is where the level transition. If someone can help would be grateful, been looking for a week now, with save states, don't know if the VR levels are different from the side scrolling or are they put together? The lawnmower man is in your head now, Dev. There's no escape, ever. You are asking for the level ID? Sorry for the horrible wording, kinda new to this. 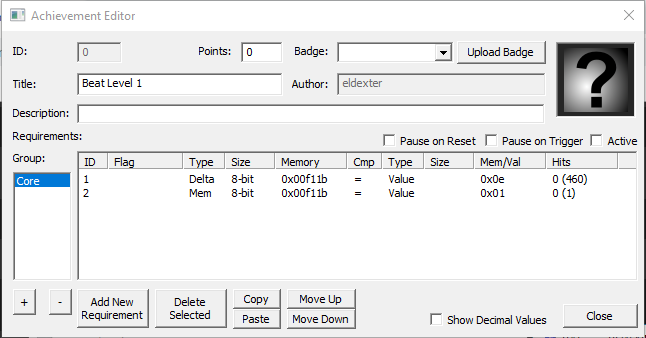 I am trying to find it in the memory viewer so I can set it up for when the player exits the level. I am not able to find it. I found the level ID is a little strange ID to be honest lol, for example the level 3 is 0 and level 1 is 0e, I erase your old "world id?" because is no longer need it. Ok Kool thanks for the help. I'll check on it when I have time and label them. Much appreciated.